friends and i climbed Beenkeragh the week before easter as part of the Coomloughra Horseshoe. we decided to go clockwise round the horseshoe but i'm sure i doesnt make to much of a difference. this was an enjoyable walk as it also consisted of a bit of scrambling over plenty of boulders. this can make it a bit strenuous when ascending Beenkeragh but i think the climb up from lough eager to skregmore was slightly harder, especially if carrying a camera in 1 hand!! 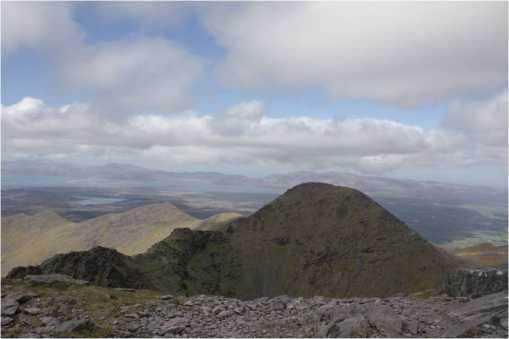 great views of caher on the approach to beenkeragh and from the top of carrauntoohil as the photo i left for it shows. the rigde looks very nice from here as well! all in all, a good walk and a scramble that gets you breathing hard if you're not afraid to push yourself.